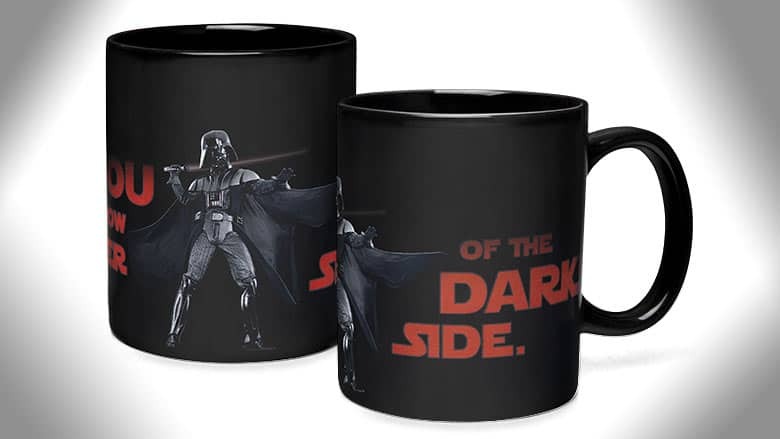 Star Wars Darth Vader Heat Change Mug | Nerd Much? We love our coffees and teas here at Nerd Much, and one thing that makes coffee-drinking even better is a great mug. Cool mugs aren’t hard to come by nowadays (thanks Obama? ), but we still had to share this cool Star Wars mug with our readers: the Darth Vader Heat Change Mug by ThinkGeek. We’ve seen heat change mugs before, but this is by far the coolest on the market. It features Vader, and as it heats up, the words “You Don’t Know the Power of the Dark Side” change from black to red, seemingly illuminating the words right before your eyes. What’s more, Darth Vader’s lightsaber appears as well. So if you’re looking for great Star Wars gifts for the upcoming holiday season, or for your favorite sci-fi-loving nerd’s birthday, look no further than the Darth Vader Heat Change Mug. For more cool stuff to buy, stay tuned to Nerd Much for great gifts showcased daily.